Each day before work María Dolz stops at the same café. There she finds herself drawn to a couple who is also there every morning. Observing their seemingly perfect life helps her escape the listlessness of her own. But when the man is brutally murdered and María approaches the widow to offer her condolences, what began as mere observation turns into an increasingly complicated entanglement. Invited into the widow's home, she meets--and falls in love with--a man who sheds disturbing new light on the crime. 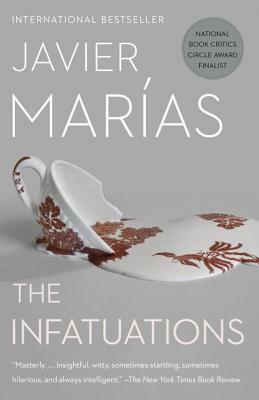 As María recounts this story, we are given a murder mystery brilliantly encased in a metaphysical enquiry, a novel that grapples with questions of love and death, chance and coincidence, and above all, with the slippery essence of the truth and how it is told. Javier Marías was born in Madrid in 1951. The recipient of numerous prizes, including the International IMPAC Dublin Literary Award and the Prix Femina Étranger, he has written thirteen novels, three story collections, and nineteen works of collected articles and essays. His books have been translated into forty-three languages, in fifty-two countries, and have sold more than seven million copies throughout the world.